The One & Only Cape Town is great hotel situated in the heart of the famous Victoria & Albert waterfront. Its location offers amazing, scenic views of the magnificent Table Mountain. Also, being less than 30 minutes drive away from Cape Town's international airport, means the One & Only Cape Town is perfectly located to meet all your holiday needs. With just over 100 rooms the hotel is small enough to feel personal but big enough to have the facilities you would want. 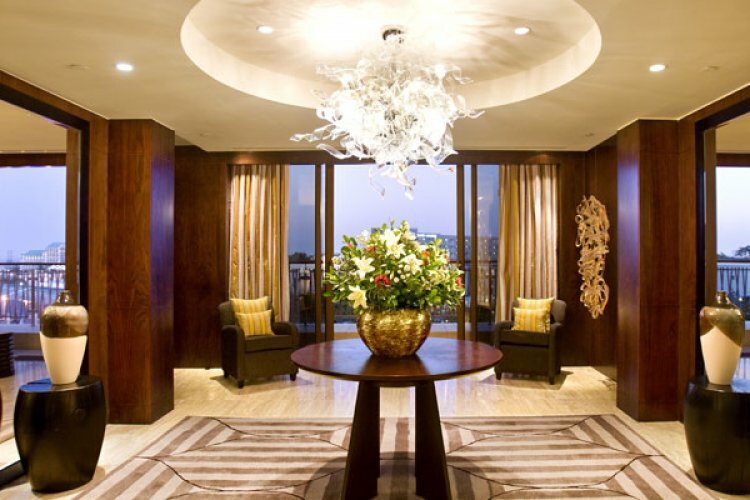 It boasts suites at the hotel which are largest of all in Cape Town. Each one has been designed using contemporary artwork, fabrics and furnishings. The rooms are designed to echo the feeling of the African Savannah. They have a vibrant African character to make your stay feel as authentic as possible. As well as being authentic they are also modern with features such as oversized baths, roomy rain showers and a butler service that can be called on 24 hours a day. As you would expect from a five star hotel, The One & Only hotel Cape Town offers an array of top of the range facilities and activities. You can indulge in Cape Town's most peaceful and friendly spa as you pamper yourself with a relaxing body massage. Treat yourself to a spa day and enjoy the picturesque relaxation room, sauna and steam facilities. There are also two spacious swimming pools which will leave you feeling totally refreshed and rejuvenated. You can head down to the hotel's top fitness centre where the latest fitness equipment and qualified personal trainers are on hand for you. Or why not treat yourself to a beauty treatment such as a relaxing manicure or pedicure, at the hotel's full service salon. The One & Only also offers spa treatments and fitness for younger guests too so that even the little ones can feel completely refreshed and relaxed. The hotel offers two exquisite 5 star restaurants as well as a magnificent wine loft with a mezzanine tasting room. Enjoy a drink or two as you gaze upon breath-taking views of Table Mountain in the vibrant lobby lounge and bar Vista. Feast on traditional South African dishes as well as international mouth-watering cuisines form around the world for that ultimate dining experience. "Mixed. 10 days of sunshine out of 21"
"1 day of rain otherwise good"
"The weather was good but a little mixed"
"Sunny, windy and 1 day rain"
"Excellent for all 3 weeks"
"hot with just one day of rain in Cape Town." "Barring two days of rain/wind sunny and hot moderated by the breeze"
"Generally the weather was excellent and not too hot. There were one or two cloudy days and a little rain in the first week but otherwise no problems"
"Hot days, cooler evenings. Currently a drought in the Cape area." "Raining in Durban to start with, but some lovely sunny days. Not too hot." "Cold at night but the days were glorious"
"Well we a little dubious before we went away as we had been warned that is was the Winter in South Africa during our stay ... we were so lucky and the sun shined for our stay and most importantly for our Wedding day ... Cape Town would still have been beautiful but was made even more stunning with the sun!" "First 2 days in Cape Town were warm and sunny, but last 2 days were colder, overcast and rainy." "Ok not as hot as we had hoped but we knew we were being optomidtic"
"Their winter was on par with the summer that we left in the UK"
"OK, a bit of rain but not much. Quite cold at times"
"Good, as it was the end of their winter it was more like an English summer"
"Spring like with teperatures around 60-65F. Bright days with some sunshine. We did not experience any rain." "first day was cloudy but brightened up and was sunny for subsequent days." "Two overcast days. Average of 26 degrees celcius. Very comfortable." "90% of the time it was hot and sunny." "Very varied - rain and winter coats in Cape town and very hot in other places. We needed the complete range of summer/winter wear!" "Brilliant, warm throughout our stay"
"suuny and warm but some days windy and quite cool at night." "Not too good for early summer (rain and wind for the middle 10 days (we were there for 21 days), but it didn't stop us doing anything." "The weather was excellent-very warm and not a cloud in sight"
Good News! There are 8 suppliers who can supply prices.